Are you curious about using virtual reality (VR) tools ethically and effectively in your user research, but have been intimidated about where to start or what to consider? David Bauer and Paula Rosecky, partners at Hemispheres Insights, gave insights to the IxDA Seattle community on how to perform user research with virtual reality tools. Hemispheres Insights is a customer insights agency dedicated to helping you understand your customers and what it means for your brand. 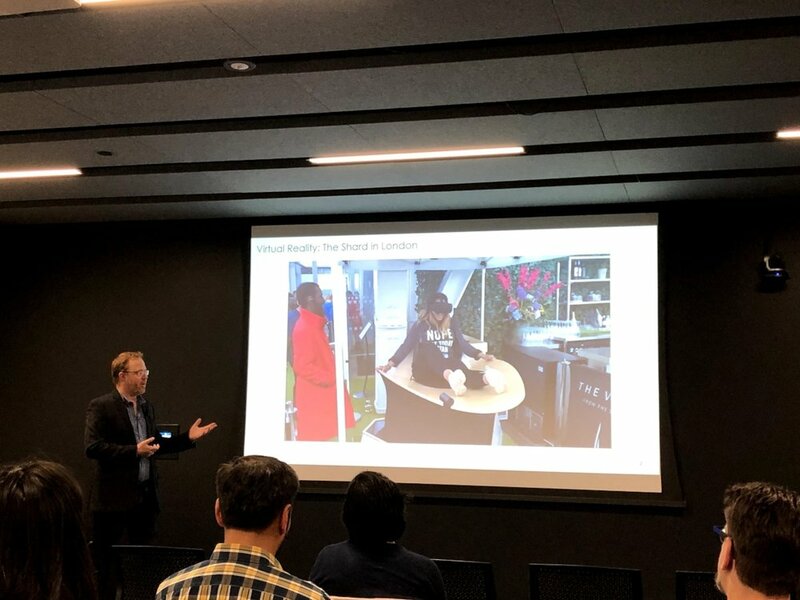 On March 13, they were generous enough to share their thoughts with the UX community at IxDA’s event, The Future is Virtually Here: Using VR for More Engaging Research. Case study on virtual reality roller coaster ride on site at “The Shard” London. “How can you put experiences into people’s homes in a way that isn’t happening today?” - David Bauer. Why does VR even matter? David outlined several ways VR provides an immersive experience. Going to Machu Picchu is a magical experience. But seeing Machu Picchu through VR in a home setting can make that experience accessible to those who can’t (or can’t afford to) summit its peak. Even for those who can go, they can use the tailored historical information embedded in VR as a research aid to prepare for and enhance their trip. VR provides another way for you to learn more in addition to, or instead of, a static book or web resource. At The Shard, the tallest building in London, you can visit the building as well as experience riding a roller coaster down from the top through a VR headset in an experience called Vertigo. This blends the real life experience of going to The Shard with an experience that reimagines how guests can be engaged. Imagine you own a grocery store chain. InContext Solutions could help your business test store layouts by building them out in virtual reality first so you can test out with customers. Prototyping such environments seems like a powerful addition to a UX team’s toolkit. However, building out environments like this is technically difficult, because interactions need to be designed and considered for the whole store to make it feel realistic. This begs the question — why not just build a real store? Testing in a VR retail space offers unique opportunities—you can test several layouts of a store and capture metrics with users before implementing that layout in real life. This kind of usability testing is becoming easier as VR devices become more available in homes and participants can be part of studies from the comfort of their home. You can even prototype customer service interactions in such an environment and compare how they perform. Currently only about 5 percent of North Americans have VR devices. Accessing participants for research studies has become easier though as more devices (like the iPhone) come embedded with virtual reality or augmented reality features. What opportunities for collaboration or participatory design will there be with virtual reality? David interviewed a variety of global VR practitioners. One of his interviewees envisions being able to play back research sessions or customer interactions with sales people who interacted with customers in VR. Being able to share those interactions across engineering, product, design, and other teams might help immerse teams in the problems their users are having, further increasing a team’s customer empathy. David on how to help research participants in studies using VR. Questions came up from the audience about ethics and how you can prepare studies with users in mind. In order not to skew data and to provide comfort to your users, David referenced Shaili Bhatt, Sr. Research director at C and R research, who always gives participants 15 minutes to acquaint themselves through a game with the VR device before diving into a study. Additionally, it's important to be clear about privacy and the data collected by your study in your study waivers. When conducting VR studies from participants' homes or their own devices, apps could be collecting data about their surroundings or data of their actions in that app. It’s important to be clear, just like in non-VR studies, about what is being collected and how that data will be used. David’s talk left us excited to explore more ways that UX practitioners can leverage VR to better understand how users interact in both real and virtual worlds. VR has a long way to go in terms of market penetration, as well as simulating other senses (like touch). However, the opportunities presented by VR for experimentation and co-creation with users present new frontiers for user research to unfold in novel ways. Thank you again to David, Paula, and their Hemispheres Insights team for sharing their time and expertise with the IxDA Seattle Community. Want more UX in VR insights? David will be keynoting May 9th at the AMA MarketMix Conference this year in Bellevue, Washington. Join us for our next event on Ethics in UX Research on Tuesday April 10th, 2018. Thank you to ATLAS Workbase for generously hosting the IxDA community for this event.